I’m in love, folks. I am truly, madly, deeply in love, and just in time for Valentine’s Day. I was already in the market for more BB anyway. I’m on my last tube, and I’m running low. I snagged a sample of this while checking out on Sephora’s website, and I’m so glad I did. Powder as Primer: Yes, you read that right. This was originally purchased as a random new item from e.l.f. to try out and review, and I’ll admit I sort of had no idea what to do with it when I got it. It’s okay as a finishing powder, but I was curious about the “primer” portion of the description, mainly because everything I know about makeup tells me that I’m putting on my makeup in the wrong order if I do this. Primer goes first, then foundation and concealer, then powder. Right? Every woman knows this. I’m here to tell you that I’ve apparently been doing things wrong all these years. This stuff… It works miracles, and it really hasn’t been given the attention it deserves. I went back and forth on how to use this, so I eventually decided that I should apply it as if I were going to go out without makeup. I went through my morning skincare routing and got my moisturizer game in order. Then I applied this with a dense powder brush (not the big, fluffy kind). There’s actually a new one from e.l.f. that works perfectly for this. A foundation brush also works. Then I let it set for a few minutes. The best way I can describe what happened next is to say that as the product was warmed up on my skin the powder residue seemed to melt away, leaving behind that smooth, soft focus finish. Every foundation I’ve applied over it has lasted longer and needed less blotting, with or without baking. I’ve used Tarte, Lancome, Make Up Forever, Maybelline, e.l.f., and L’Oreal. I’ve used concealers by e.l.f., Maybelline, Tarte, and Sephora. EVERYTHING has stayed put for hours longer than I thought it would, and this little $2 product has quickly become my baby. And then it went out of stock, and I couldn’t find a link to it on e.l.f.’s website without searching Google, which tells me that it’s likely this has been discontinued. I’ve been Googling and trying to find something similar, and meanwhile I’ve hit pan. Now, I’ve never seen another product like this, but knowing e.l.f., it’s probably a dupe of something more expensive out there. So off I flew earlier today to hit up a few makeup counters. I think I confused the hell out of the poor salesperson at Sephora. When I told her I’d been putting powder on under my foundation and a mattifying or brightening primer over it, she looked at me like I’d just tried to take a bite out of the Too Faced Chocolate Bar display. I can’t say I’d blame her. I thought the same thing until I’d tried this stuff. So yes, I get that it sounds like the strangest thing in the world, but it really does work, and I’m completely hooked. Thankfully, one of the other associates there knew about the technique and pointed me toward a similar product by Too Faced. They didn’t have it in stock, unfortunately, so I’ll have to wait until it’s delivered to do a full review on it. As best I could tell from the sample, though, it looks like I’ve found my new go-to. I’ve already posted about how I ended up using this instead of my usual, and now that I’ve had a full 24-hours to play with this, I figured I’d give it a full review. Amazonian clay 12-hour full coverage foundation by tarte. Link, if you’re interested in purchasing. 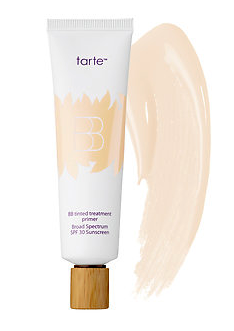 An oil-free, 12-hour liquid foundation formulated with Amazonian clay and non-chemical sunscreen filters. Provide full coverage for 12 hours. Provide SPF 15 sun protection. Adjust to all skin types for longer wear. I used a combination of circular motions for all over coverage and stippling over blemishes, and I have to admit that it looked absolutely beautiful in various lighting. This definitely provided a good full coverage that was both blendable and buildable, as the product claims. I didn’t need extra concealer for my blemishes, though I did use concealer under my eyes. It did seem to float above my pores a bit, but it didn’t really reduce the appearance of them any more than I’d get by using other products I already own. The finish was satin-matte as promised, and it did look very natural. If not for the coverage itself, I’d have guessed I wasn’t wearing anything at all. It looks like skin. I wore this for Thanksgiving, so this got tested through a pretty substantial meal as well as being in a crowded home (read: sweat). And I kept it on for a good 12 hours. It was really comfortable, and I almost forgot I was wearing it. At about 6 hours I had to blot. That’s pretty good, considering that I can get oily at times, so I definitely think it’s living up to the claim that it adjusts to your skin type to help it provide truer and longer coverage. When I wore it the day before and the consultant forgot to moisturize and prime me first, it still managed to wear well– maybe even a little bit better. At about 8 hours, though, it was getting a tad splotchy. I blended it all back in with my foundation brush, but that ended up requiring me to also refresh my blush a bit. It smoothed out nicely, but it was definitely wearing thinner by this point. I don’t consider that to be true 12-hour wear, and it’s definitely not as persistent as what I’m used to. I’m not impressed, but I’m intrigued. I’m going to take advantage of Sephora’s current online deals to grab this and try it out a little more. I’m still undecided, if I’m honest, but I know that if I hate it, I can always return it and get something else. I’m not happy right away with the wear time on this. It might do better if I skip primer (though I WOULD NOT consider skipping my moisturizer), and I like to test out a new foundation a few different ways before I make a final decision. I also want to see how it holds up to a full day of work. That’s the real test of a good full-coverage foundation for me, as it’s really the only time I’d wear one. (I don’t really do full coverage unless I’m having pictures taken or going to be working a special event. Even with a breakout, I’ll normally eek by on a medium coverage foundation or a BB cream, depending on what I’m doing that day.) I really like the finish of this one. It looks amazing on me– better than my usual product, which is also more expensive. My local Sephora carries it, meaning I don’t exclusively have to purchase it online. So I want to experiment with it a bit and see if I can make it work. Posted on November 27, 2015 November 29, 2015 by JennaPosted in BeautyTagged amazonian clay, Beauty, benefit, brush, Clinique, concealer, e.l.f., Foundation, POREfessional, powder, primer, Review, Shiseido, smashbox, tarte, That gal.